All images: Work by Vera Kox / Courtesy and copyright the artist. 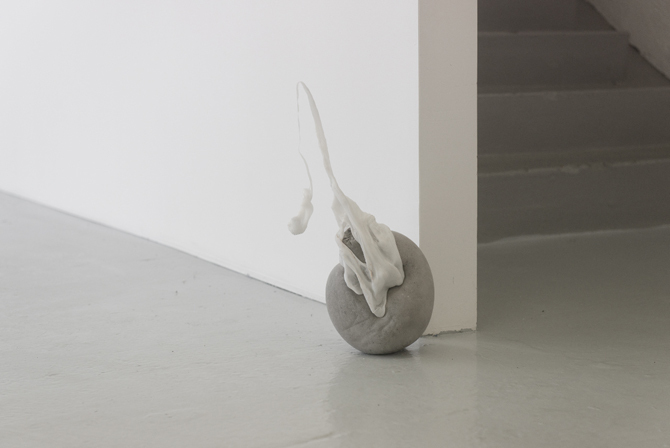 Sticky, soft, damp, stony, crumbly, sleek – there is a whole range of opposing adjectives that come into mind when looking at sculptures and installations by Vera Kox. 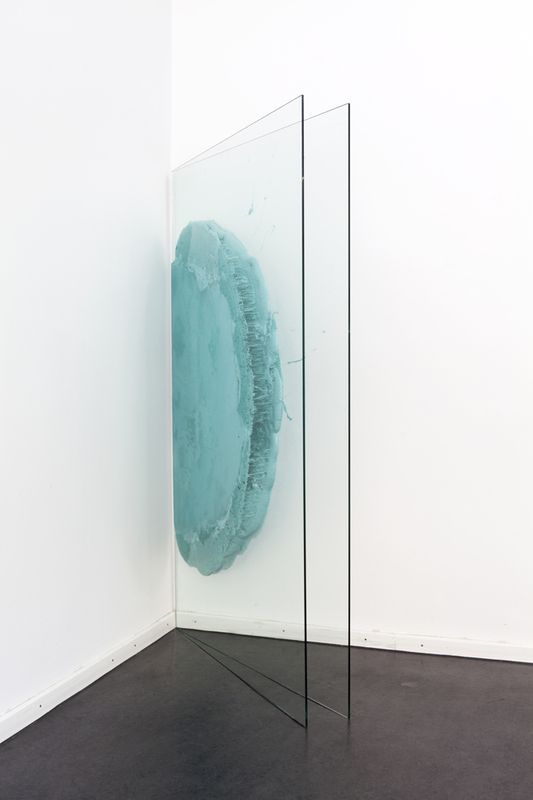 She employs a minimalist language, continuously playing with the antagonism of light and heavy, fluid and static material. 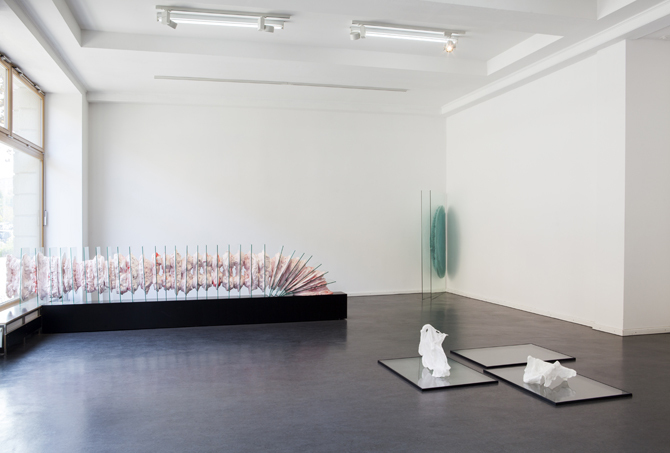 Having finished her Master in 2010 at Goldsmiths College in London, the 1984-born sculptor translates her research in tangible preconceptions of materials into transitions of forms. Kox' objects often seem fragile, but they are also seductively encouraging a curiosity in the truth of their own tactility, while remaining untouchable and thus shattering expectations. 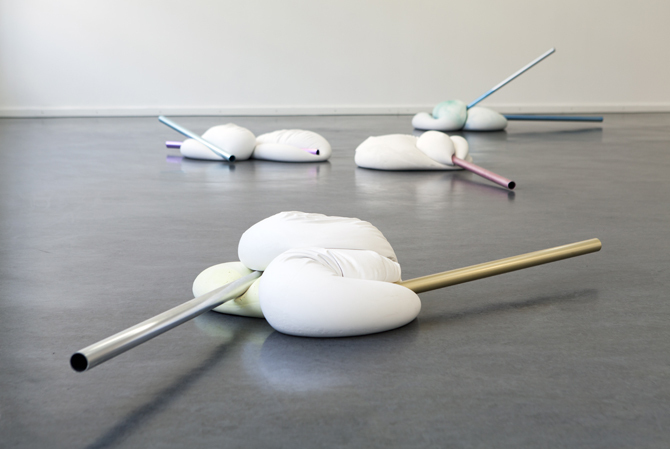 In a short interview the German artist told us about her interest in this fluctuation and about her current show at GREEN IS GOLD in Copenhagen. 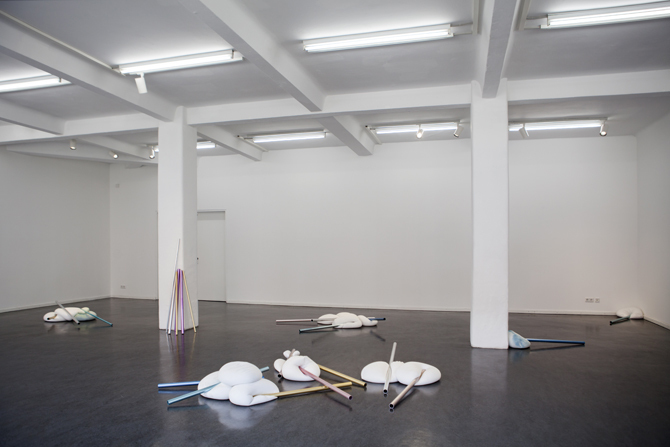 Anna-Lena Werner: Vera, you just spend one year in Berlin as a resident at Künstlerhaus Bethanien in Berlin. Are you planning to stay in the city? Vera Kox: Yes, for the time being I am planning to stay in Berlin. It's been a great year for me, having been able to focus entirely on my work in a very generous studio. It was a welcome change after working in small and shared studio spaces in London for many years. 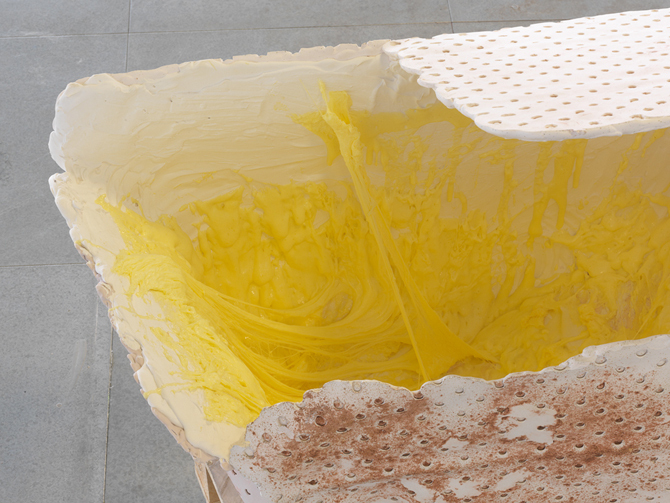 Anna-Lena: How would you describe the relationship between your practice – the haptic making-process – and the outcome? Vera: I would like to think that there is always a strong sense of the haptic process within the final object or installation. It is important to me that you get a sense of touch simply by the visual impact. I play with anticipated notions of materiality, which often turn out false on closer inspection of the sculptures. What seems soft is actually hard, what seems liquid is solid. It is a play with preconceptions, the image of the thing versus the thing itself, which I want to confuse. 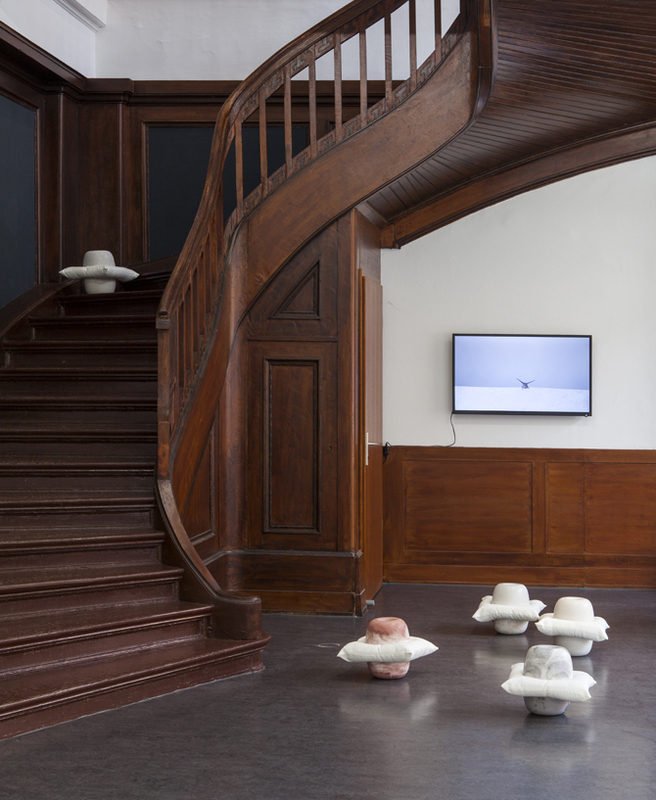 Anna-Lena: The materiality of each of your works highlights its own solidness or lightness. How is the consistency of relevance to your objects? Vera: I work with all sorts of material that surrounds us every day, which I transform in a way that seems different to how I know it. Rather than the monumental, static sculpture I am interested in fluctuation and material changing from one state into another. 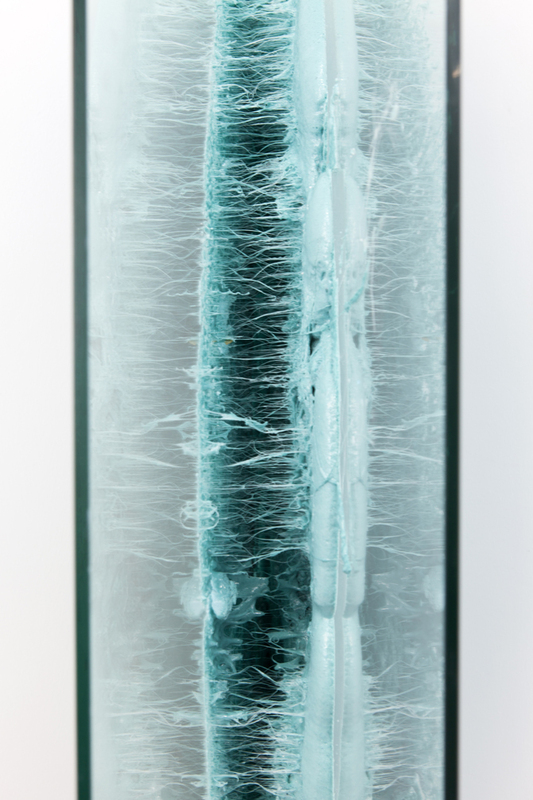 There is a fascination with different physical states, which I refer to in my work. It is in particular the ones that are hard to grasp that I am interested in. Anna-Lena: You often confront two opposing materials within one object. “Reassuring Inertia” incorporates a stone that is encircled by a pillow. Others consist of glass and foam. 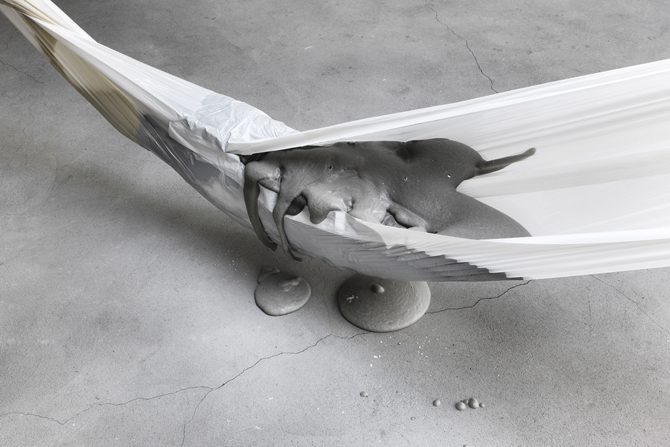 Also the work “words to mouth”, in which you combined fluid and hardened Polyurethane Foam with plastic sheeting, plays with this sort of contrast. What do you find compelling about these contradictions and transitions? Vera: It is often something that happens rather unconsciously, ending up with a very limited pair of material. It is an abstraction process I go through in my studio: I usually start out with a multitude of ingredients and the more I elaborate on the work, the more defined it gets. 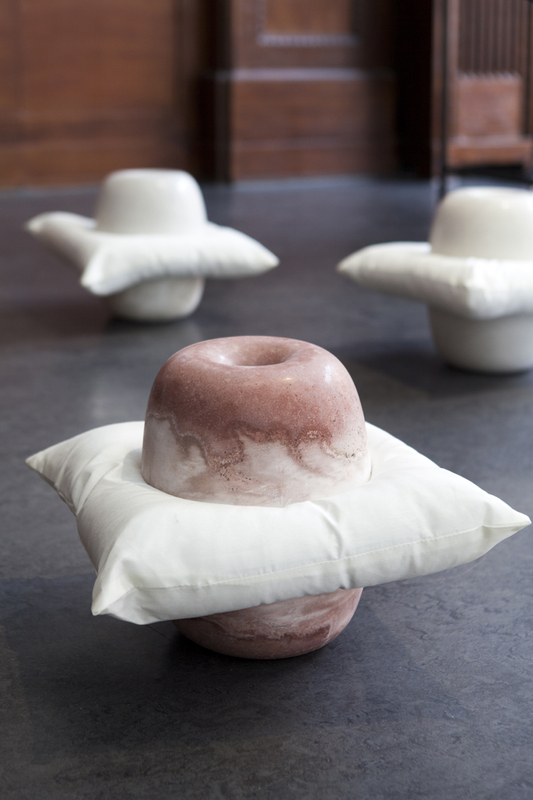 The objects with the pillow you pointed out, are actually made from concrete and pigments. The division between natural processes and the manmade is blurry to me. 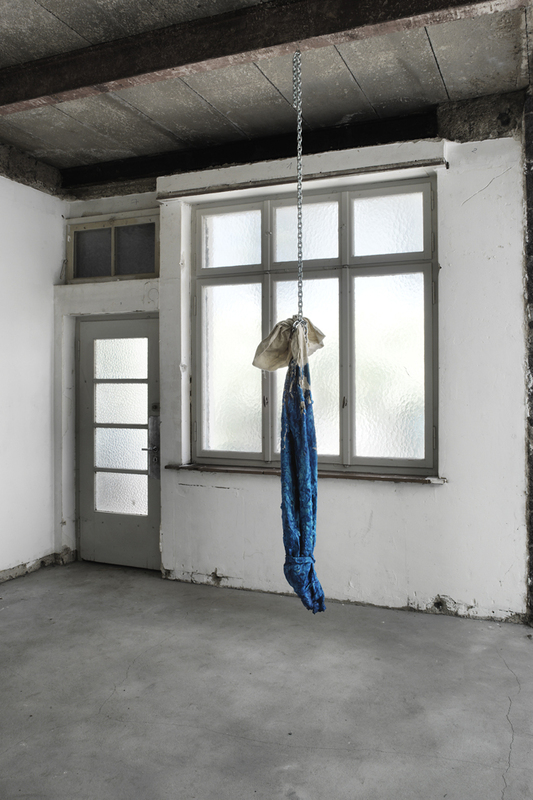 Anna-Lena: Your method of installing work is unconventional: Some pieces are suspended from the ceiling, others seem to balance on the floor, some are simply placed in a corner. Is there a specific strategy behind your installments and how is the spectator a part of your concerns? 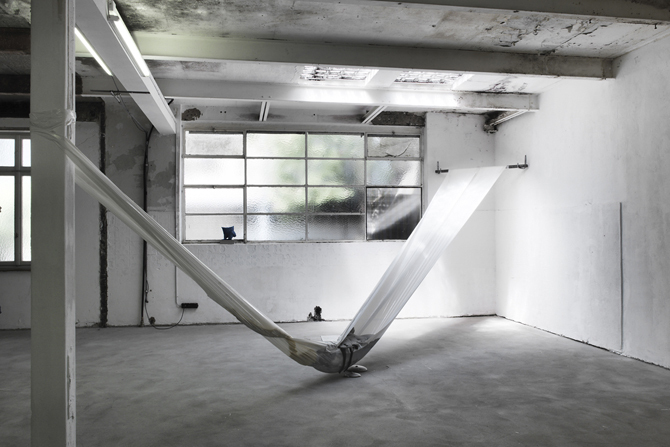 Vera: The installation process is very much dictated by the sculptural elements themselves and the exhibition space. There is no clear method as such, just a way of trying to avoid a specific language that has established itself over time and still being able to use more than just the floor to exhibit. I try to pay little attention to the viewer and put the focus on the object instead, because I think the viewing of art has been compromising the object to be seen at a specific height, comfortable for the viewer. I'd like to think that we will go on our knees and on our toes to see something that we are curious about. Anna-Lena: Is beauty of importance to you? Vera: I am not sure how to define beauty, but the attraction towards inanimate matter is compelling to me and I am trying to understand how this works. 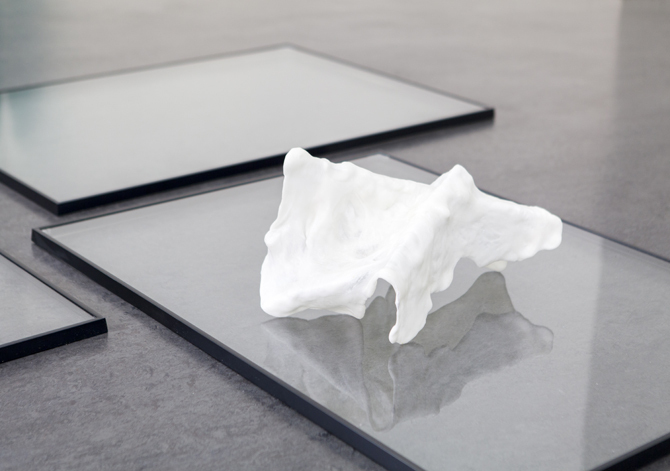 Anna-Lena: One of your smaller objects has the title “Temporary forms and permanent doubts”. Are permanent doubts a good or a bad thing? Vera: That is the title of the series I showed alongside Dag Erik Elgin at Galleri Opdahl in Stavanger. I hardly ever give titles to individual sculptures, but I rather think of them as working titles, which bring together several sculptures for a defined time and space. I sometimes regroup them in a different show, so their title can shift. It is important to me that the title can be flexible and temporary, just like ideas change and adjust if necessary. Anna-Lena: How do you start a new object or a new series? 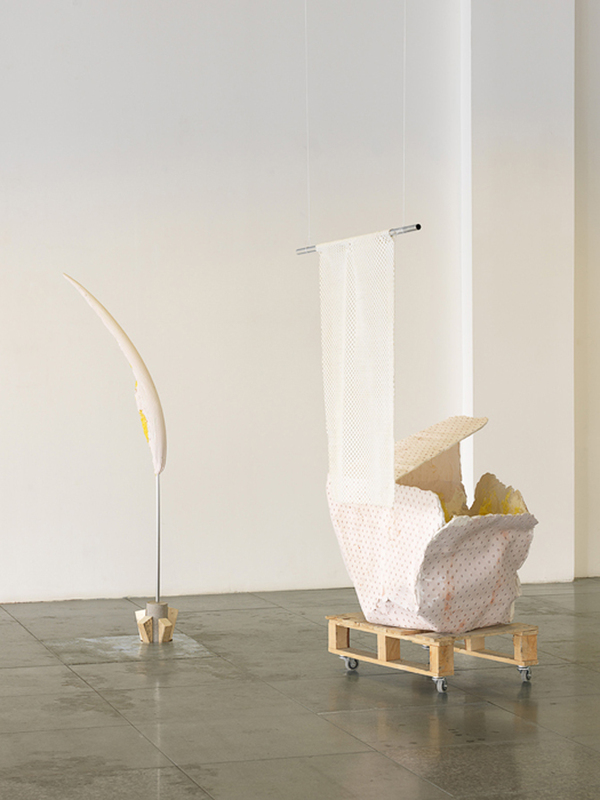 Anna-Lena: Your current exhibition “Ponderous Push” takes place at the project space GREEN IS GOLD in Copenhagen. What are you showing there? Vera: It Is a new installation that I have had in mind for the last year, as well as a film made in collaboration with australian artist Sam Smith, and I am happy to be able to show it at GREEN IS GOLD. The directors Ditte and Amalie are running this place with a lot of dedication and I am always fond of artists who take the initiative and use their time and energy to set up a space to show what they think needs attention.